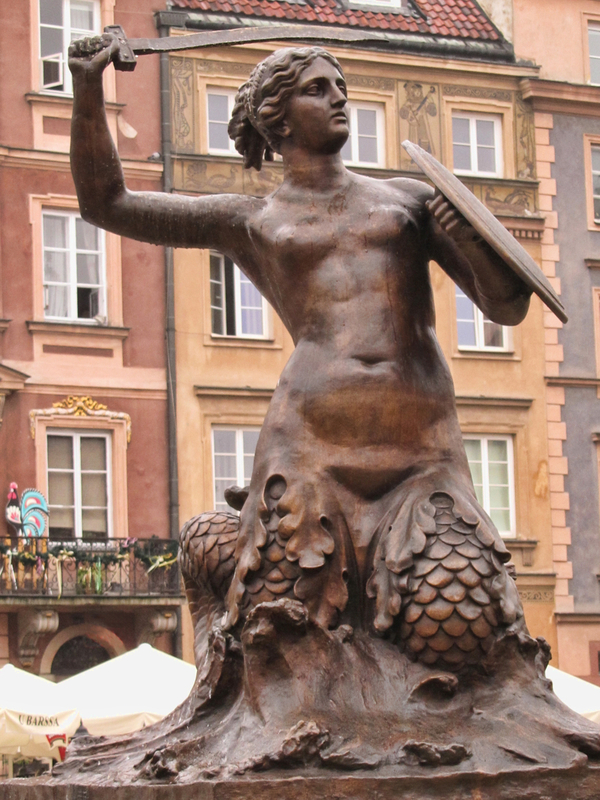 The Syrenka Mermaid Statue in Warsaw Old Town Market Square. Photo © by Jacek Kadaj. 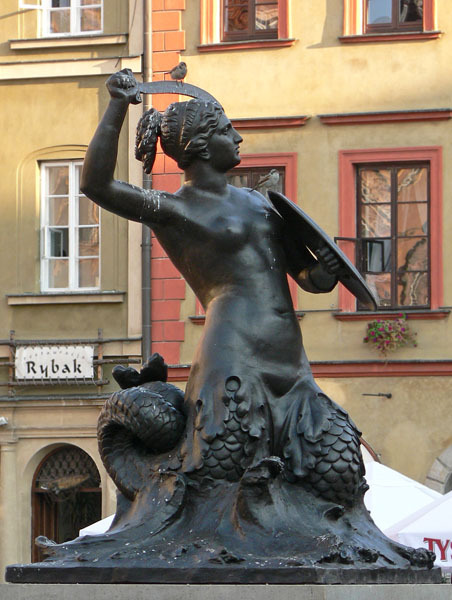 Syrenka Mermaid Statue in Warsaw. Photo © by Hans Cornette. This mermaid statue was made in bronze by Konstanty Hegel in 1855. 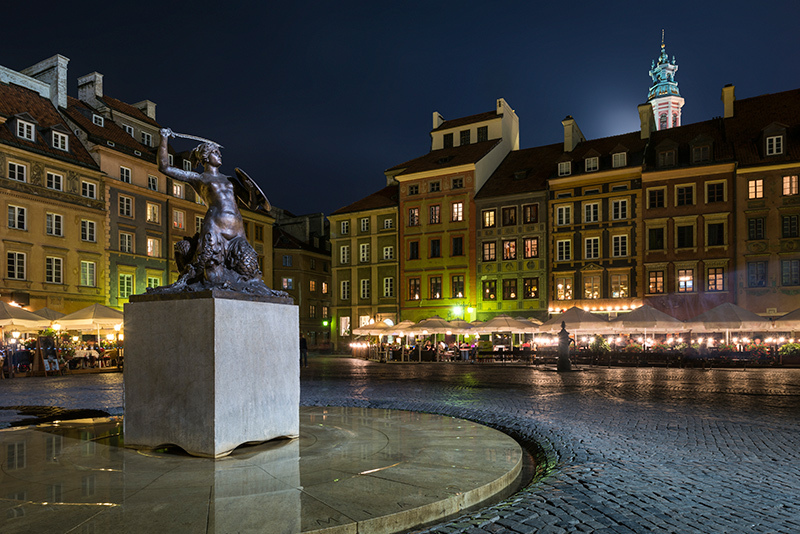 The above statue is a zinc cast from the original, placed in Warsaw’s Old Town Market square. The square is one of the city’s top tourist attractions. 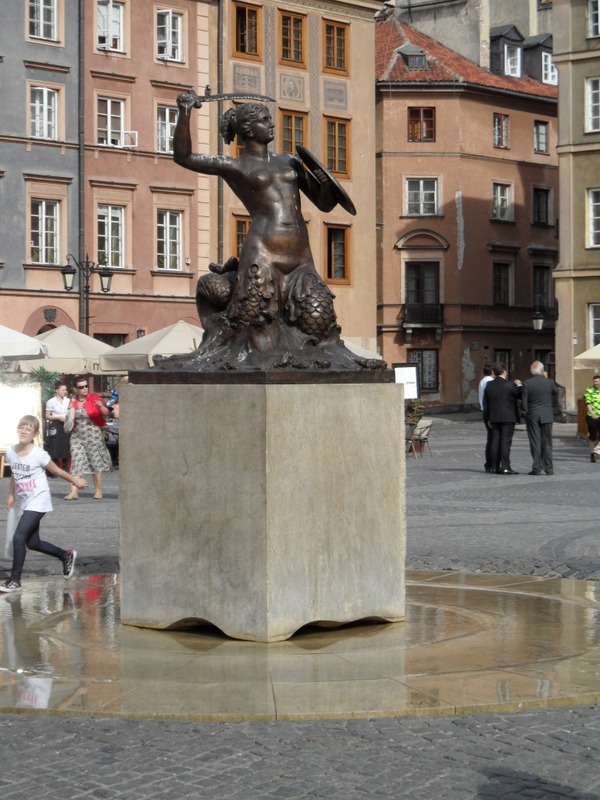 There are many representations of the Syrenka throughout the city, including another mermaid statue near the River Vistula. There are different stories of how the mermaid came to be the city’s protector. One story has it that the Syrenka, whose name actually is Melusina, is the sister of the famous mermaid in Copenhagen. One of the sisters swam up to the Danish straits and stayed there. The other sister swam to Poland and up the Vistula River, right to where the Old Town Market is today. She liked it and stayed and was popular with the people there for her singing. When she was caught and held prisoner by a man wanting to profit by her, she was freed by the local people. In gratitude she promised to protect the people if they were ever in danger. Tracing the history of the city’s coat of arms, it started out in the late 14th century as a dragon with a male human head, holding a shield and a sword. The head and upper body were later replaced with those of a woman, with the dragon tail remaining. Eventually in the 16th century the dragon tail was replaced with a mermaid’s tail. In this statue, the Syrenka is a two-tailed mermaid, with a tail on each “leg”. 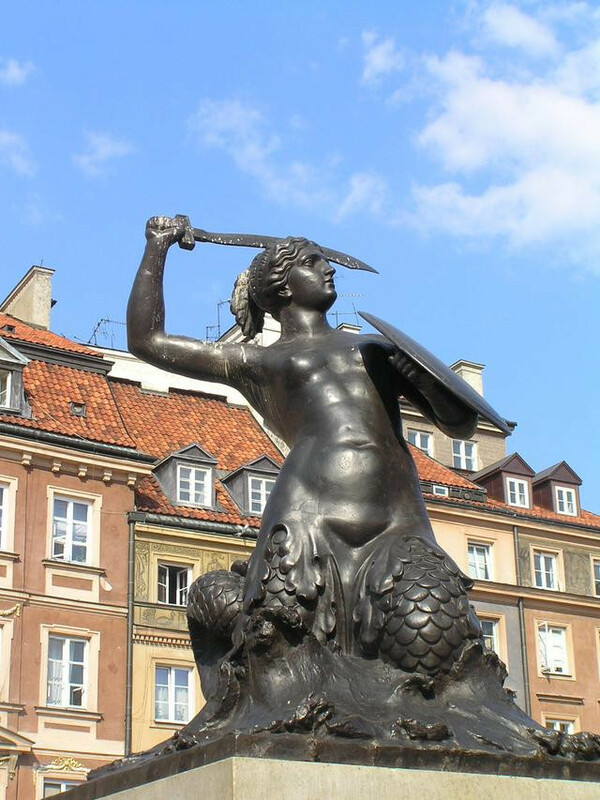 Warsaw is just one of the cities with mermaids as their icon. 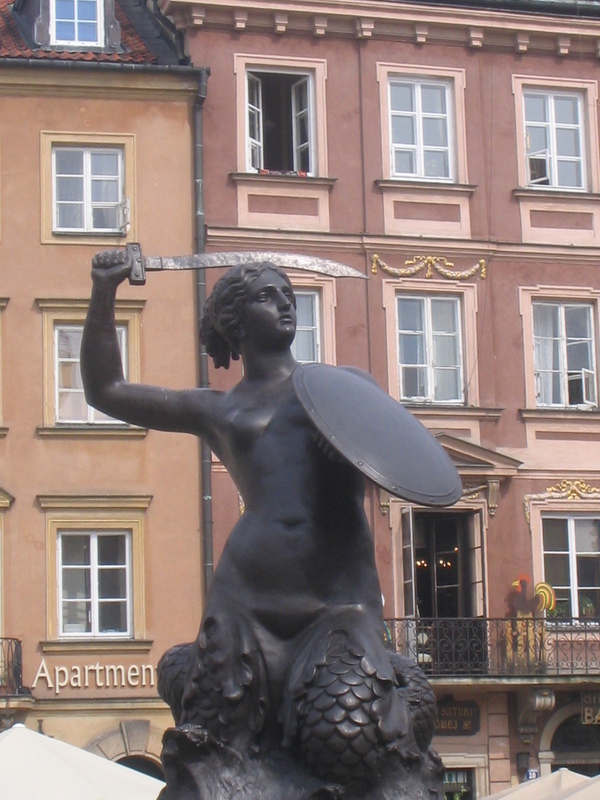 The Syrenka Mermaid Statue in Warsaw Old Town Market Square. Photo © by Siyad Ma. 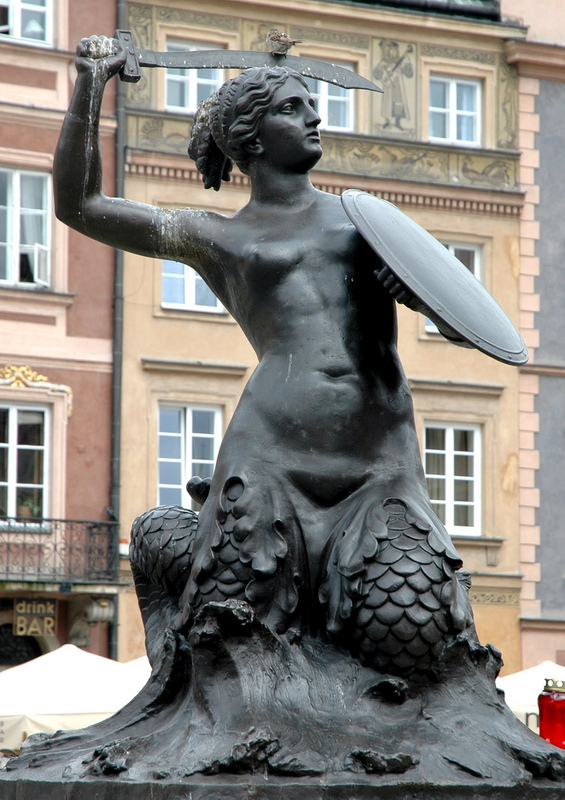 Syrenka Mermaid statue in Warsaw. Photo © by Terence Faircloth, Atelier Teee, Inc.
Syrenka Mermaid Statue in Warsaw. Photo © by Vojtech Zuzanak. Warsaw Mermaid Statue. Photo © by Alasdair Dougall. Additional images: If you would like to contribute additional photos of this statue – or any mermaid statue – please contact us.